Ceccato -> About Ceccato Aria Compressa S.p.A.
About Ceccato Aria Compressa S.p.A.
Ceccato Aria Compressa S.p.A. with its headquarters in Brendola (Vicenza, Italy), has more than 60 years experience in compressed air technology, and is today one of the leaders in the compressed air business in the Italian market. We have an important position in the European market and are rapidly increasing our presence in other continents. We distribute our products worldwide through more than 1000 dealers with whom we have built up real partnerships. Today Ceccato Aria Compressa S.p.A has a complete range of piston compressors, screw compressors, dryers and ancillary equipment available. After the acquisition by the Atlas Copco group in 1998, emphasis was placed on the re-layout and modernizing of our production facilities and on the redesign of the complete product range. Today more than 95 % of our products are less than 3 years old and the state-of-the-art, efficient production facilities are a reference in the market. All products are designed and manufactured in accordance with ISO 9001 and ISO 14001 certification and all models conform to the rigorous ISO 1217, Ed.3, Annex C-1996 acceptance test code, the guarantee of dependability anda long service life. The design, assembly of our products and manufacturing processes are state of the art and our team of more than 150 dedicated and highly experienced employees together with our sales and after sales support network every day make the difference. Ceccato Aria Compressa S.p.A. is one of the few screw compressor manufacturers that also develop and produce their own dryers as well as being the biggest refrigerant dryer manufacturer in Europe. The in-house experience on the development of screws as well as dryers gives us a unique strength and enables us to realize a perfect technical match between the screw compressor products and the dryer products; a vital combination in most compressed air applications. Since 1994, Ceccato Aria Compressa has been operating with a Quality System certified under UNI EN ISO 9001. Ceccato have also developed, adopted and certified an Environmental Quality Management System conforming to the latest ISO 9001:2000 and ISO 14001 standard, an indispensable tool for the orderly and coherent management of all activities related to quality and the environment. 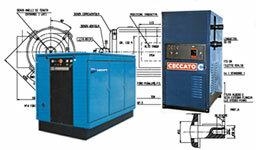 1939 CECCATO designs and produces piston compressors and service station equipment. 1974 Expansion of the compressor business, CECCATO is the first company to introduce rotary compressors to the Italian market. 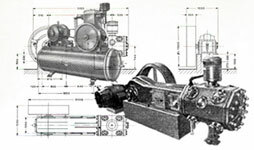 1975 First in Italy in production of silenced piston compressor range FONOSTOP. 1979 Extension of the compressed air business with the addition of refrigeration cycle dryers. 1998 January The Compressed Air Division is acquired by the Atlas Copco Group, under the name of CECCATO COMPRESSORS ( Ceccato Aria Compressa SpA ). 1999 November Under new management, and relying on the strengths of the new owner, CECCATO COMPRESSORS launches an ambitiousmodernization plan, to up-grade both the manufacturing facility and the company's product range. 2000 March The factoryis re-designedto include newproduction lines and test cells. 2001 July CSB is launched. 2002 September The new range of screw compressors CSC is launched. 2006 New DRF coaxial screw compressor is launched. 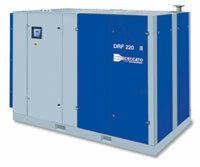 2007 New piston compressors range. New CSB from 15 to 40 HP. Air Energy Ltd.- authorized dealer of Ceccato Aria Compressa S.p.A.